I'm a big fringe fan (Fringe is also pretty good), but it has to be done right. Many of you will disagree, but I hate hippie fringe -- macrame, suede, etc. It just looks like a sloppy costume to me. The style of the piece needs to remind me of pre-WWII era. Fringe is back for spring, but I think neither my flapper sensibilities nor becca's hippie vibes will be pleased. One of my more steadfast fringe rules is that it has to be actual fringe not just strips of cloth. Following that rule would have prevented this skirt from looking like a bloody paper-shredder accident. The biggest offender in that department, however, is shredded, faux-vintage tees. Maybe you are capable of rocking this look. If so, please send photographic evidence that it can be done. When I see these shirts, all I can think of is Miley Cyrus and her ilk trying to show adults that they're serious grownups because they know what Woodstock is. This tee shirt has actual fringe but it's only on the sides. Of course the model's wearing leopard print daisy dukes with her sideburn shirt. Let's not speak of this again. Since fringe can be purchased relatively cheaply at the hobby store, I don't like paying a lot for it. Maison Martin Margiela is known for being fashion forward, but a bra with fringe attached shouldn't cost nearly $400, even though the construction is far superior to the $72 knock-off. Another rule of fringe is that it needs some movement. If the material is too stiff or the fringe was cut too short, it loses some of the shimmying fun and the fringe sticks out in odd directions. 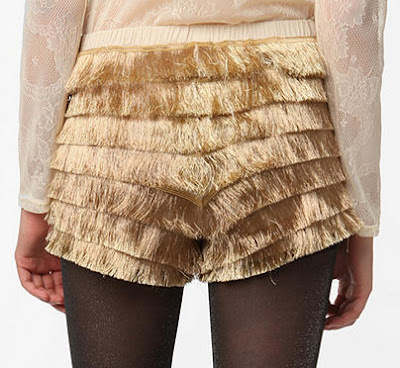 Not only are the people at Urban Outfitters unaware of this, but they also think gold hot pants are a good idea in general. Which of these horrors is the worst offender? Do you like fringe in general? Are you pro-hippie fringe? I can't begin to judges which of these is the worst. As much a love some great hippie attire, I usually draw the line at hippie fringe. I agree--costume. I do love some fun flapper fringe here and there, but I've never really figured out how to work the hippie fringe.